Sky TV Black Friday deal: Free LG 4K TV with Sky Q bundle | What Hi-Fi? There was every chance Sky was going to get in on the Black Friday deals action, and sure enough here it is with its own Black Friday TV bundle. 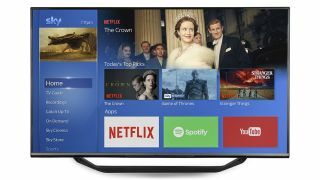 The special package offers a Sky Q 2TB box and 18-month subscription to Sky Entertainment, Sky Cinema and Sky Ultimate On Demand for £55 per month. That's a decent saving of £10 month or £120 a year over the regular price. If that’s not tempting enough, Sky is also chucking in a free 43in LG 4K TV - either the LG 43UK6200 (£485 on Amazon) or the LG 43UK6300 (£350 on Amazon). Not bad eh? Note that there are one-off £75 installation and £9.95 delivery charges, though. This Sky Black Friday Bundle deal offer ends 30th November. But that's not all. For existing Sky customers, Sky is slashing the price of its Soundbox soundbar from £299 to just £220 until 30th November. It's certainly a competitive price for the wireless-speaker, which we gave four stars to last year and deemed a 'positive success' at its £300 asking price. Non-Sky customers can also get a Soundbox deal, the soundbar is on offer for £499, down from its original £800 price tag.